The “Blog” of “Unnecessary” Quotation Marks: ooo "soap making"
Ben saw this on the Missouri State University campus in Springfield, MO. There's a lot of quotation marks here, and I am going to just suggest they are all code for keg parties. Other suggestions? That is a lot of quotation marks. That ending quote is the best. I imagine people wandering around the streets of the town, extolling the virtues of the 3rd saturday of each month. Apparently, they were thrilled to find a hidden cache of unused quotation marks and wanted to show them off. I just couldn't pass this one up. Oh, and @Jami -- I'm in my fourth year there, and I'm still skeptical, too. 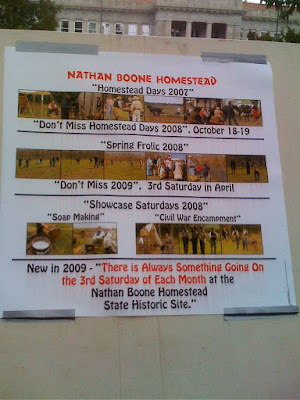 I like to read one of the first quotes as a command: "Don't, Miss Homestead Days!" Seriously, what was Miss Days thinking?